where f: E → Rn and E is an open subset of R n . We show that under certain conditions on the function f, the nonlinear system (2) has a unique solution through each point x0 ∈ E defined on a maximal interval of existence (α, β) ⊂ R. In general, it is not possible to solve the nonlinear system (2); however, a great deal of qualitative information about the local behavior of the solution is determined in this chapter. In particular, we establish the Hartman-Grobman Theorem and the Stable Manifold Theorem which show that topologically the local behavior of the nonlinear system (2) near an equilibrium point x0 where f(x0)=0 is typically determined by the behavior of the linear system (1) near the origin when the matrix A=Df(x0), the derivative of f at x0. We also discuss some of the ramifications of these theorems for two-dimensional systems when det Df(x0) ≠ 0 and cite some of the local results of Andronov et al. 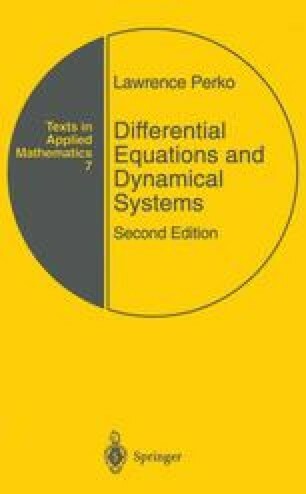 [A-I] for planar systems (2) with det Df(x0)=0.